Following it’s £32million redevelopment Doncaster Racecourse reopened to critical acclaim. Home since 1776 to the world’s oldest Classic, The St.Leger, Doncaster is now undoubtedly one of the finest racecourses in Europe with entertainment facilities to match. The St.Leger is the fifth and final Classic of the season and the only one to be staged at a northern racecourse. 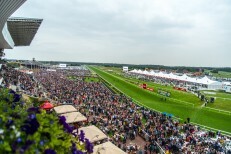 The St. Leger Festival provides a unique opportunity to experience the tradition, colour, excitement and glorious atmosphere of the spectacular new Doncaster Racecourse. Whether you choose to entertain on Leger Legends Opening Day, Ladies Day, Doncaster Cup Day or the St Leger Day itself you can be sure of first class track action, superb hospitality and a warm & friendly Yorkshire welcome.